This article is about the Guardian class. For the moon of Saturn, see Titan (moon). Constructors of the City Wall. "What does it mean to be a Titan? As a Titan, you are a part of the City - in a way no Warlock or Hunter could understand. The dream of the City rests upon our shoulders." The Titan is a class of Guardian. They tend to have the highest armor of any of the three classes in Destiny and the lowest agility. "Strive for honor. Stand for hope." They are equipped with suits of powered armor that boost their strength and endurance. Titans utilize their strength and skill with firearms to kill their enemies. Titans have long honed the Light of the Traveler, passing these skills to each new generation of warrior. Their strength gave birth to the City, and they have taken a blood oath to ensure it will always stand strong. The Wall surrounding the City was built by the first Titans, who also perished defending it. Steadfast and suresighted, Titans face any challenge head-on, serving as living, blunt force instruments of the Traveler’s will. "The first Titans built the Wall, and gave their lives to defend it. Now, you stand in the same high place, steadfast and sure, protecting all who shelter in your shadow. You hail from a long line of heroes, forged from strength and sacrifice. Our enemies may be deadly and merciless, but so are you." All Guardians have certain abilities, some of which are granted by the Traveler. All Guardians have a vertical movement ability and a "grenade-type" ability whose effects vary by class. All these abilities with the exception of the double jump can be upgraded over time and can be used in competitive PvP. Striker—"At close quarters a fist is better than any gun." An Arc combat class with a heavy emphasis on armor and crowd control. Super—Fist of Havoc: One of the powers of the Titans is an Arc Light area-of-effect ground punch. Melee—Storm Fist: A powerful melee attack which utilizes arc light to annihilate enemies. Defender—"The wall against which the Darkness breaks." A defensive class used for both shielding and strengthening offense. Unlocked at level 15. Super—Ward of Dawn: The Titan casts a small bubble shield of Void Light around itself and allies. Guardians who enter the shield receive a temporary boost to defense or offense when they wander back outside of it. Grenades—Magnetic Grenade, Spike Grenade and Suppressor Grenade. Melee—Disintegrate: Another powerful melee attack, which upon killing an enemy, creates a Force Barrier around you, absorbing incoming damage. Sunbreaker—"Forge the fury of undying suns." A Solar artillery class focused on strong offense, recovery, and ability buffs. Available in The Taken King. Super—Hammer of Sol: Summon a flaming hammer and wreak destruction down upon your enemies, whether up close and personal or at a distance. Grenades—Thermite Grenade, Fusion Grenade, Incendiary Grenade. Melee—Sunstrike: Ignite your enemies with a heavy solar strike. Sentinel—"Valiant heart, unwavering resolve." A Void class that can be focused for offense or defense. Super—Sentinel Shield: Summon a glowing shield and use it to destroy your enemies however you choose. Grenades—Magnetic Grenade, Voidwall Grenade, Suppressor Grenade. Melee—Void Fist: Disintegrate enemies with a Void-charged punch. Commander Zavala—Titan Vanguard representative. Closeted fan of crocheting. Deputy-Commander Sloane—Vanguard Scout assigned to oversee Vanguard interests on Titan. Lord Saladin Forge—former Iron Lord who survived SIVA. He guides players—The Guardian—through the Rise of Iron storyline. Lord Shaxx—Crucible Handler who aides Guardian in PvP combat. Located in the Tower, next to Arcite-99, the Crucible quartermaster. Orin—A member of the Pilgrim Guard and friend of Mara Sov who was transformed by the Nine into their Emissary. Ouros (voice only)—Last Magistrate of The Sunbreakers. Killed by the Red Legion alongside the rest of the Sunbreakers. Aodh—Second Empyreal Magistrate of the Sunbreakers. Bretomart—A member of the Iron Wolves and a student to Lady Jolder. Callisto Yin—A member of the Firebreak Order who saved the Flame Victorious from the Last City when the Red Legion attacked. Emonda Swale—A member of the First Pillar Order who died in battle in the Cosmodrome. Gunnvor, the Dawncaller—A member of the First Pillar Order who died in battle at the Ocean of Storms, most likely during The Great Disaster. Holborn—The commander of Holborn's Host and leader of an expedition searching for Warminds on Mars. Jagi—Leader of the fireteam Jagi's Host that disappeared south of the Cosmodrome. Lady Jolder—An Iron Lord and close friend to Lord Saladin. Jolder made the sacrifice to seal SIVA away, preventing it from going out of control. Kabr, the Legionless—A titan who lead the first mission to breach the Vault of Glass and used the parts of Vex units as pieces of his armor. Unfortunately, the lingering Vex presence in his armor consumed Kabr's mind but in his final act, he poured all his light into the Aegis, a weapon capable of breaching the Templar's shields. Karl-A bouncer at the Seven Stars. Kei-Ying—A member of the First Pillar Order who died in battle at the Twilight Gap. Liu Feng—A member of The Sunbreakers who forged the Sunbracers and Sunshot. Luke Romagne—A member of the First Pillar Order who died in battle in the EDZ. Lord Radegast—Founder and leader of the Iron Lords. Rezyl Azzir—One of the very first Guardians revered for stabilizing the City; went missing but later revealed to be the dreaded villain, Dredgen Yor. Saint-14—A legendary Guardian who was beloved by nearly everyone he met and who killed Solkis, Devil Kell. Went missing after going to Mercury searching for Osiris. Lord Silimar—An Iron Lord who specialized in building defenses. Thalor—A titan whom reigned undefeated in the Crucible before being murdered by Dredgen Yor. Tubach—Second in command of the Holborn's Host. Vell Tarlowe—One of the six members of Eris Morn's fireteam when they attempted to assassinate Crota, Son of Oryx. Killed by the Thrall spawn of Alak-Hul, the Darkblade. Wei Ning—A legendary warrior who was a part of the attack to reclaim the Moon from the Hive. Tragically, Wei Ning was personally killed by Crota. 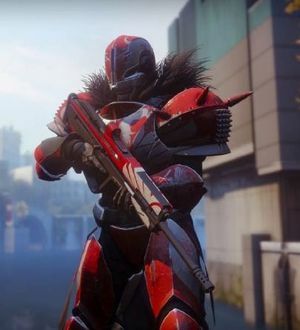 Titan armor was inspired by Medieval armor layered over tight-fitting suits. The armor worn by the Titans is similar in overall design to the MJOLNIR powered armor worn by Spartan supersoldiers in the Halo series. The SPARTAN-II program's creator, Dr. Catherine Halsey, considered calling the project "Titan" before settling on the final name. The T-shaped visors of some Titan helmets are reminiscent of the Corinthian-style helmets used by the ancient Greeks. Such helmets are strongly associated with Spartan hoplites, both historically and in popular culture. The Titan emblem represents the four Titan Orders which stood during Six Fronts. A Titan (right) in The Law Of The Jungle live action trailer. ↑ Destructoid: Destiny's Combat is Solid, But I'm Not So Sure About the Rest of it. ↑ If it's the first character created, otherwise interchangeable after character creation is done and story mode has been started.